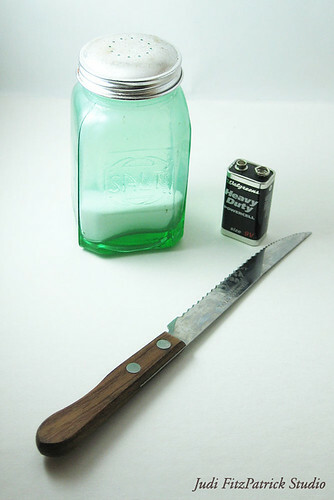 A Salt and Battery with a Deadly Weapon - 194:365, originally uploaded by Judi FitzPatrick Studio. I've been meaning to do a good shot of this idea (took one once before but didn't really like it.) I think I watch too many crime shows. I hope this gives you a laugh. LOL - Yes it did give me a laugh. Thanks, Marlene, glad it did. I love all puns, whether they be visual or auditory. Thanks! Thank you, Jim, for stopping by. Glad you like it. I hope to have more in the days to come. Mary, I don't watch Dexter, just have a warped sense of humor sometimes. Thanks for stopping by!